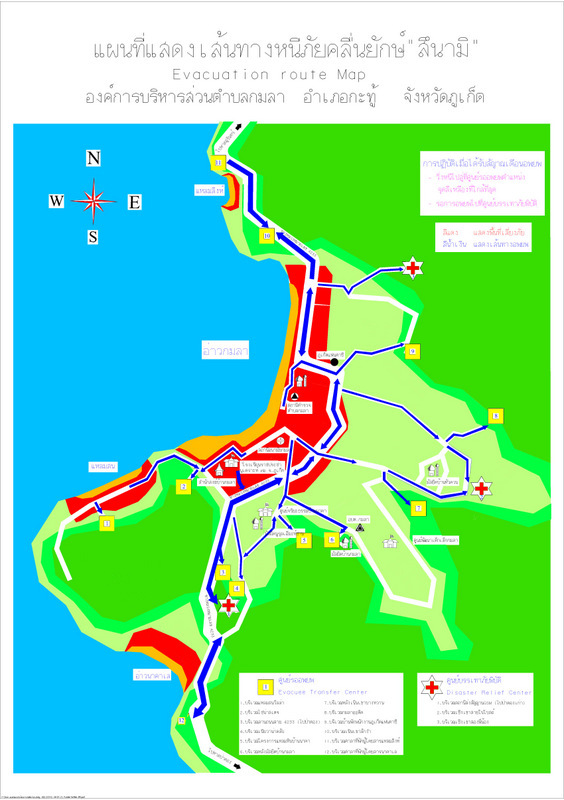 PHUKET: Tsunami evacuation routes for the popular tourist beaches at Patong, Kamala, Kata and Karon, and elsewhere in Phuket’s main coastal areas, are undergoing a full review. The move comes in the wake of the devastating earthquake and tsunami that struck the Indonesian island of Sulawesi on Sept 28, leaving nearly 2,000 people dead, some 5,000 believed missing and more than 74,000 homeless. 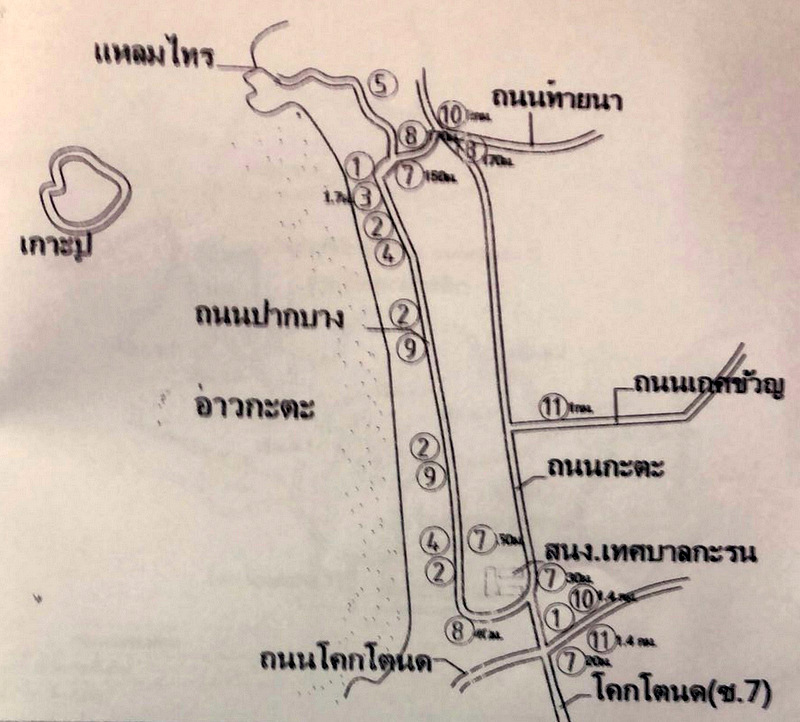 Phuket Governor Phakaphong Tavipatana ordered for the evacuation routes in main beach areas to be revised and new maps drawn up last Thursday (Oct 4). 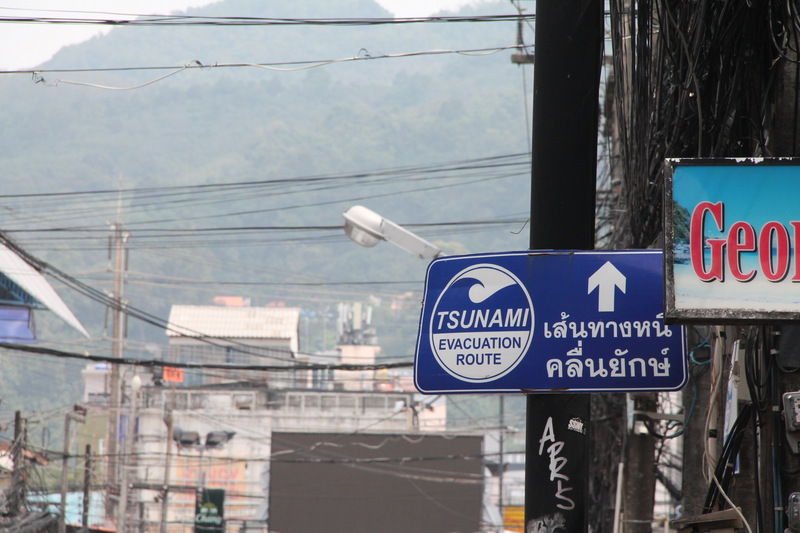 The moves also follows a call last Thursday by an expert who helped to create the Phuket’s tsunami-warning system to fully review the system (see story here). 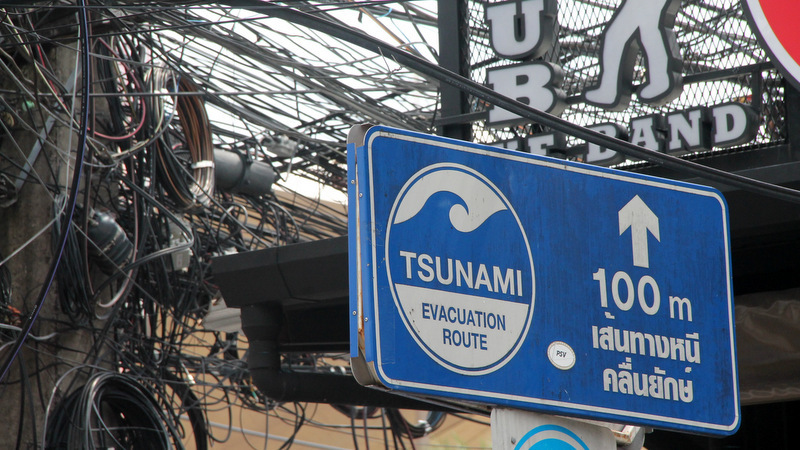 An official at the National Disaster Warnig Centre (NDWC) in Bangkok on Wednesday confirmed to The Phuket News that all 19 tsunami-warning towers were now fully operational, though some could still be "improved". However, local administrations are under pressure to complete their reviews of tsunami-evacuation preparedness as quickly as possible as Gov Phakaphong is expected to call relevant officials to present him with updates on their progress next week. 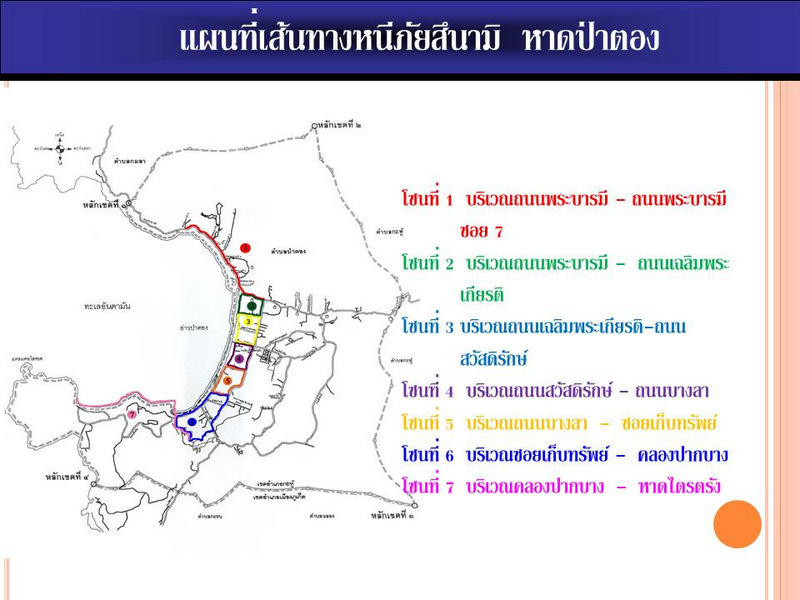 Prapan Kanprasang, Chief of the Department of Disaster Prevention and Mitigation Phuket office (DDPM-Phuket), explained to The Phuket News that tsunami-evacuation routes are the responsibility of local administrations, not his office. 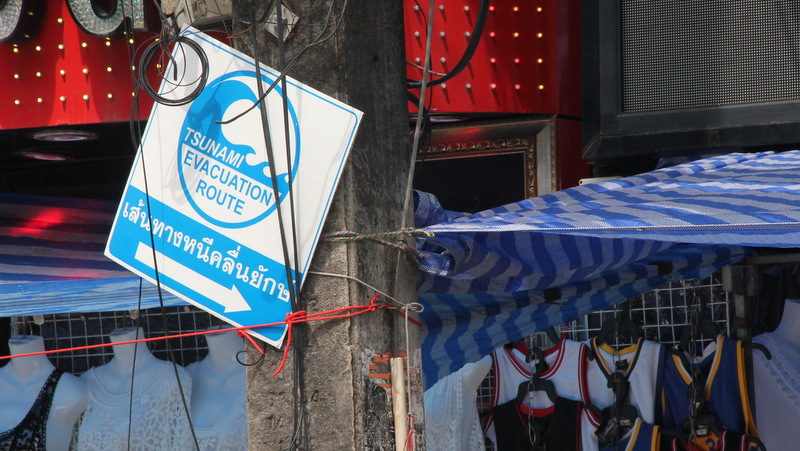 “Local administrations must inform the DDPM-Phuket of the evacuation routes and safe assembly zones – but the responsibility for choosing the routes, having signs installed and making sure safe zones are maintained is the local administrations’ job. “We can help them and provide support, but this is the local administrations’ responsibility,” he said. Patong Deputy Mayor Boonma Aeapsap confirmed that his officers were on the streets on Wednesday (Oct 10), inspecting the existing routes and safe assembly zones in Phuket’s busiest tourism town. “We are inspecting and collecting information on the current routes and safe zones in order to update our map as fast as possible. Most routes will remain the same, but some will change due to the construction of new buildings,” he said. Mr Paitoon also noted, “All 110 evacuation signs must be replaced or relocated. Our inspection today (Oct 10) found advertising signs obscuring evacuation signs, while other signs were simply broken and others covered by cables. “Plus we need to update our 13 safe zones in Patong as the number of people that these zones need to accommodate has changed. There are a lot more people in Phuket. We are looking for extra sites with the space needed, hopefully to be volunteered by some people or businesses, in case a tsunami strikes,” he added. Further north, Nopporn Karuna, Deputy Chief Executive of the Kamala Tambon Administrative Organisation (OrBorTor), admitted that he has been far too relaxed about tsunami-evacuation preparations. “We haven’t even had a tsunami-evacuation drill for three years,” he said. For Mr Nopporn, the issue of tsunami preparedness is personal. The Asian Tsunami of Dec 26, 2004 cost him 12 family members. “Seeing what happened after the tsunami hit Palu brought flashbacks of the 2004 tsunami,” he said. “I lost my mother, sister and other family members and relatives – 12 family members in all. I lost my house and everything in it on that day,” Mr Nopporn recalled. “This has encouraged me to push the changes through by using the OrBorTor’s emergency budget. I will not wait for funds to arrive,” he told The Phuket News. “Some routes need to be improved, including the area around the graveyard on the Kamala beachfront,” he noted. The graveyard, officially called the Kamala Islamic Cemetery, features a wall nearly two meters tall and some 440 metres long along the beachfront, preventing any form of escape for beachgoers caught between the wall and sea. “This may be a private area, but we will talk with the people responsible for maintaining the cemetery about the wall. I will ask them to unlock gates in the wall so people may pass through the cemetery, but only in case of a tsunami,” Mr Nopporn said. Further, Mr Nopporn added, “All our evacuation routes will be revised and new routes created if necessary. New bigger evacuation signs will be installed and the safe zones rechecked and new ones designated if needed – all before the end of the year. “And we will hold a tsunami-evacuation drill early next year,” he assured. “Three new big signs showing a map of the evacuation routes will be set up beside the beach, as well as at main tourist attractions in the area, and we will share the map with hotels in the area soon as it is ready,” Mr Nopporn said. “Once we have this information, we hope within the coming week, we will post it online so people can see it and download it from our website,” he added. 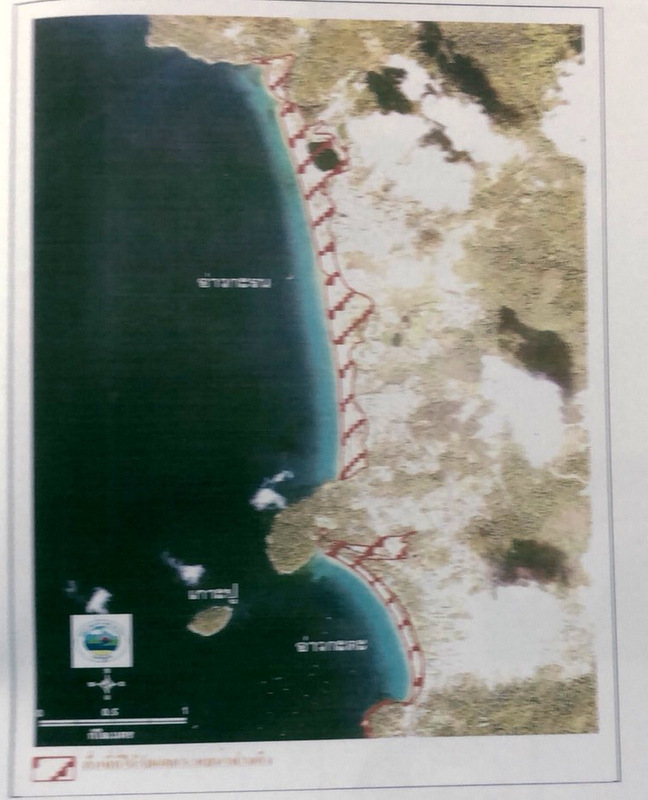 South of Patong, at Kata and Karon beaches, efforts are also underway to review the tsunami evacuation routes and safe zones. 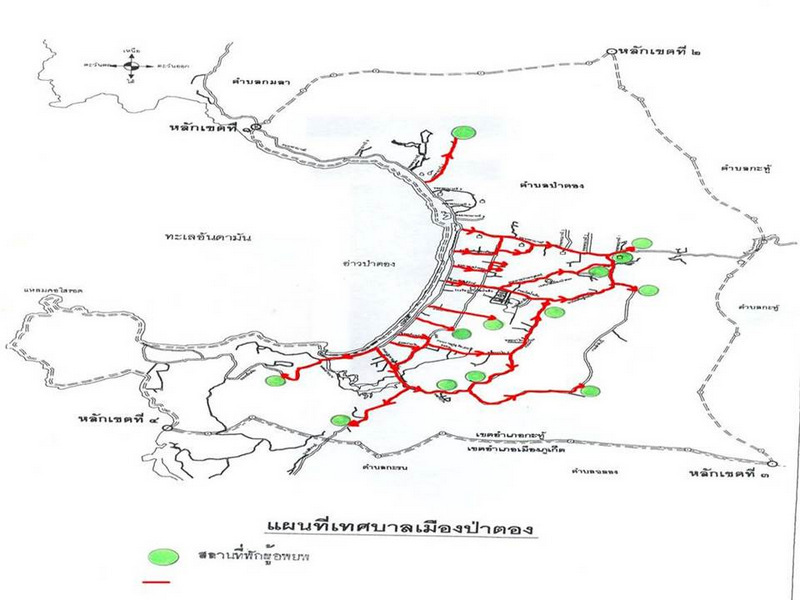 Supachai Chanphet, head of the DDPM office at Karon Municipality, told The Phuket News on Wednesday, “The current map of tsunami-evacuation routes and safe zones for Karon and Kata was fully revised and underwent a big update three years ago. “Right now this map is only on a chart in our office – but we will create a GIS version and share it online this week,” he said. Amazing, the tangle of many dead cables on bangla road ( photo 3) and elsewhere on Phuket. Hello Phuket, Smart City 4.0, remove the dead stuff, recycle it! It is unused money, tangling in the air. Make Phuket more beautiful and same time make some money for the provincial money coffers, to spend for the environment. Well, those maps of Patong don't even show 3rd road, and that's been there since what, 06? So they've apparently never been updated since the Tsunami. This kind of disregard for the future is prevalent in so many aspects of life here and is exactly why the Tsunami buoys seem to never be working. There are just 3 ways in and out of patong. 2 are coastal roads. The other is over patong hill. The last time there was a tsunami warning, everyone was making for the hill. When people (Thais) got to the top, they wouldn't go any further. Therefore there were many people stuck in patong as they quite rightly wouldn't use either of the 2 coastal roads. Can't see past their noses. Just a waste of time, money and effort. Why a map and signs? Just move away from the sea to high ground, which you can see ahead of you. Just leave the idiots who want to wander to the beach to see the big waves roll in. How often does a tsunami occur? After reading this: Here it is: What is the use of reviewing evacuation routes , without nonsense talk who is responsible, as long as NDWC is criminal negligence more than 6 months already to have a off shore warning system not working? Do I have to spell it out? First NDWC, after that DDPM-Phuket. Don't mess it up with  foggy thai officials not to the point talks. Get it right for next time!